Sunday, Nov. 18, through Sunday, Dec 2. Take a look at the display in the narthex and order books and gifts for the special children in your life! In place of our usual worship on Wednesday, Nov. 21, members of First are invited to join in a special, ecumenical worship service on Thanksgiving Eve at 7pm, at Onalaska United Methodist, 212 4th Ave. N. Our former vicar, Tara Shilts, will preach, and several choir members will be part of the worship service. This year’s Community Thanksgiving Dinner will be on Thursday, Nov. 22, from 11am-2pm at the Onalaska Armory. The Onalaska Rotaries are organizing the event this year and are looking for volunteers and donations. To make a monetary donation, send checks (made out to OEF) to: Onalaska Enhancement Foundation, Thanksgiving dinner, 415 Main St., Onalaska, WI 54650. Advent is a season full of rich traditions for both home and church. We invite all members of First Lutheran to join us on Sunday, Nov. 25, at 9:15am in Fellowship Hall for our annual Advent Around the Table event. We will create advent wreaths for our homes, chrismons for our trees, and advent calendars to help us keep the days of Advent. Along the way, we will learn more about this particular season, have great fellowship and grow in our faith as we kick off the Advent season. Suggested donation to cover costs is $10; donations will be collected at the door. It’s a relaxing way to volunteer! 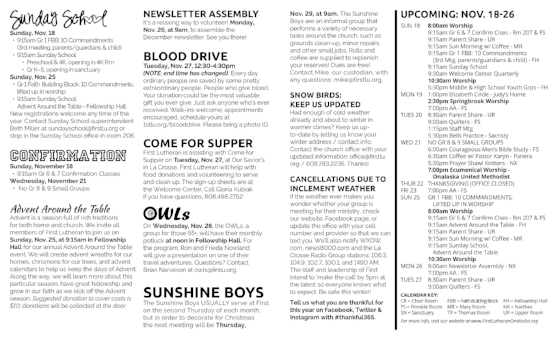 Monday, Nov. 26, at 9am, to assemble the December newsletter. See you there! On Wednesday, Nov. 28, the OWLs, a group for those 55+, will have their monthly potluck at noon in Fellowship Hall. For the program, Ron and Frieda Nowland will give a presentation on one of their travel adventures. Questions? Contact Brian Narveson at owls@firslu.org. The Sunshine Boys USUALLY serve at First on the second Thursday of each month; but in order to decorate for Christmas the next meeting will be Thursday, Nov. 29, at 9am. The Sunshine Boys are an informal group that performs a variety of necessary tasks around the church; such as grounds clean-up, minor repairs, and other small jobs. Rolls and coffee are supplied to replenish your reserves! Dues are free! Contact Mike, our custodian, with any questions: mike@firstlu.org. Tell us what you are thankful for this year on Facebook, Twitter & Instagram with #thankful365. A Faith Alive! U course presented by Pastor Libby Howe on Sunday, Dec. 9, 6pm. How could understanding ‘others’, from Christians of other denominations, to believers of other religions, to non-believers help us to clarify our own Christian identity and purpose? Assistant to the Bishop for the La Crosse Area Synod—and one of our own members!—Pastor Libby Howe will talk about whether we can learn about ourselves by learning about ‘others’ without simply trying to force them in to becoming more like us. It is a wonderful time of year and a great way for our kids to spread their Christmas joy! New date and time this year: Sunday, Dec. 16, between services from 9:30–10am. Friday, December 21, 6:15pm. Please join us at First Lutheran for an hour of worship including music, prayers, candlelight and reflection on what God is up to amidst our blue feelings around Christmas. Before worship, starting at 5:30pm, there will be a time for a light meal and conversation.